안심사는 법주사에 딸린 작은 절이다. 통일신라 혜공왕 11년(775)에 진표율사가 지었다고 하는데 편안한 마음으로 제자를 길렀다 해서 안심사라는 이름을 붙였다고 한다. 고려 충숙왕 12년(1325)에 원명국사가 다시 짓고 인조 4년(1626)에 송암대사가 수리하였다고 하며 한말에 고쳐 세워 오늘에 이르고 있다. 지금 있는 대웅전은 확실하게 지은 시기를 알 수는 없지만, 1979년 해체·수리 때 발견한 기와의 기록으로 미루어 조선 인조 때의 건물로 보인다. 석가모니 불상을 모셔 놓은 이 건물은 앞면 3칸·옆면 2칸 규모이며, 지붕은 옆면이 사람 인(人)자 모양을 한 맞배지붕이다. 원래는 맞배지붕이 아니었을 것으로 추정하는데 여러 차례 수리를 통해 건물이 축소·변형되면서 지붕 형식도 바뀐 것으로 보인다. 지금은 지붕 처마를 받치기 위해 장식하여 짜아 만든 구조가 기둥 위뿐만 아니라 기둥 사이에도 있는 다포 양식이다. 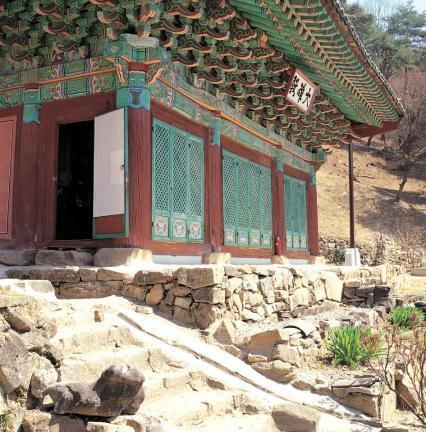 Ansimsa Temple is a small hermitage that belongs to Beopjusa Temple. Ansim means peaceful state of mind. 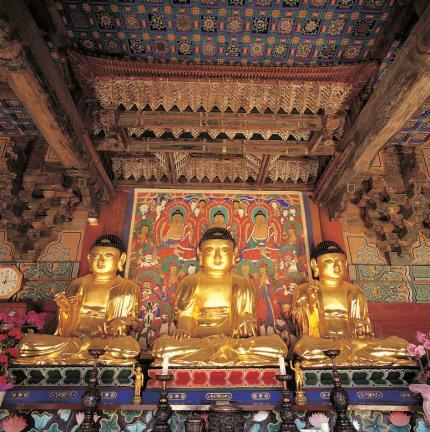 This temple was so named because the monk Jinpyoyulsa educated his students here peaceably in 775, the eleventh year of the reign of King Hyegong of Silla. 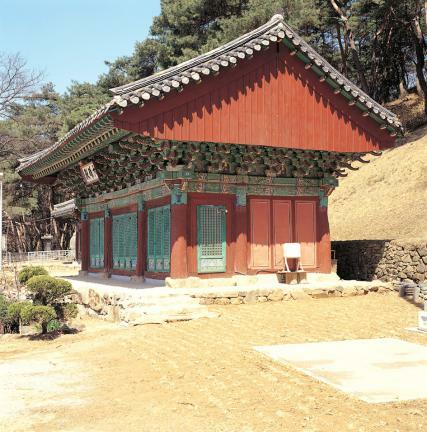 The National Preceptor, Wonmyeongguksa, rebuilt it in 1325, the twelfth year of the reign of King Chungsuk of Goryeo, and Songamdaesa repaired it in 1626, the fourth year of King Injo of Joseon. However, it is not certain when the temple was first built. 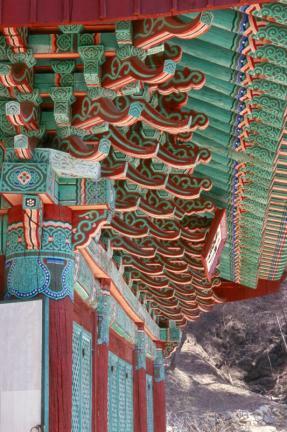 Even the Sangnyangmun Gate does not keep any record of this while other facts such as the start and end of construction and participants were recorded. 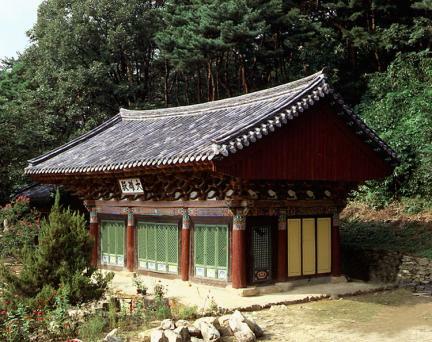 Sangnyangmun was discovered in 1979 when Daeungjeon Hall was renovated. 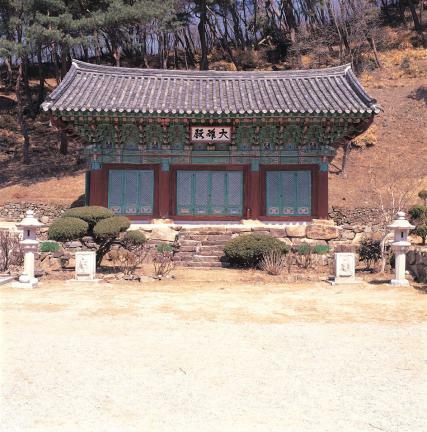 It is estimated that the present Daeungjeon was built in during the reign of King Injo as a tile with the inscription ‘Ganghui Eleventh Year (1672)’ that was found during the renovation indicates. 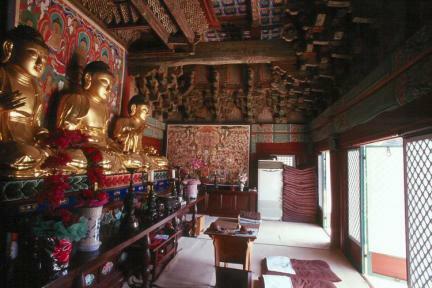 The hall is designed to enshrine a Buddha statue and is composed of three partitioned rooms from the front and two from the side. 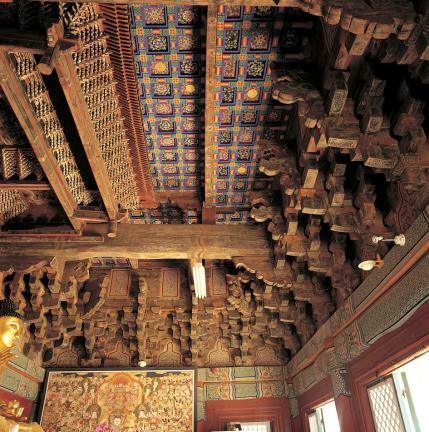 It is a dapo style of building, in which gongpo that is designed to hold up the eaves of the roof on a pillar is set up not only on the pillars but also between them. 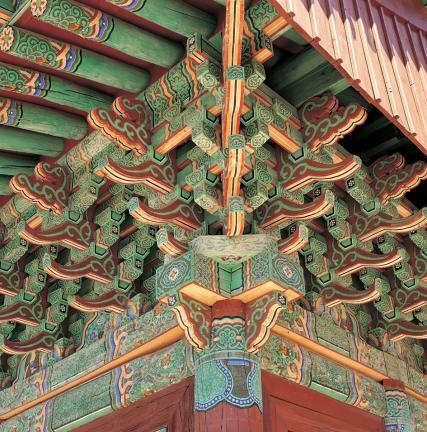 The roof was built in matbaejibung style which was the simplest type of roof, though it is supposed to have been built the first time in paljakjibung, the most splendorous roof style, which from the side looks like the caret. It is presumed that the roof style changed as the main body of the building was reduced and transformed through several phases of renovation. 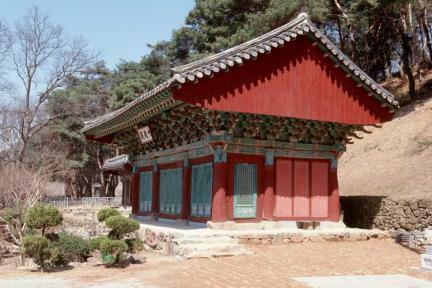 The hall provides good examples of transitions in building styles. 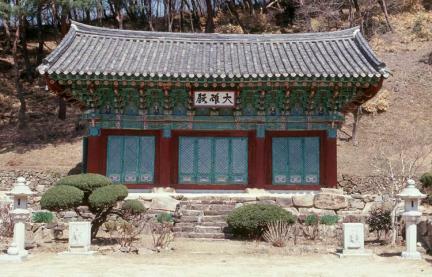 Eungjinjeon Hall of Bulyeongsa is a similar case. 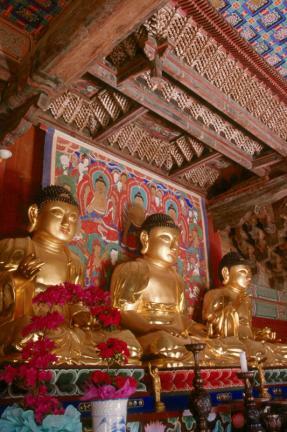 A Buddha triad is enshrined inside the building and another picture of Buddha is hung on the wall. This picture, made in 1652, the third year of King Hyojong’s reign, is painted with a piece of 4.68 cm by 7.5 cm. It was designated as Tangible Cultural Asset No. 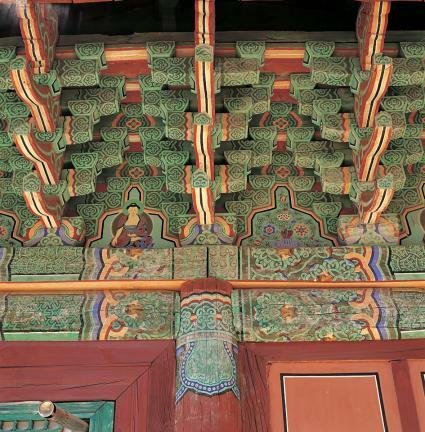 51 of Chungcheongbuk-do Province.